TriviaMatic brings the biggest sport game of the season to your restaurant or bar. 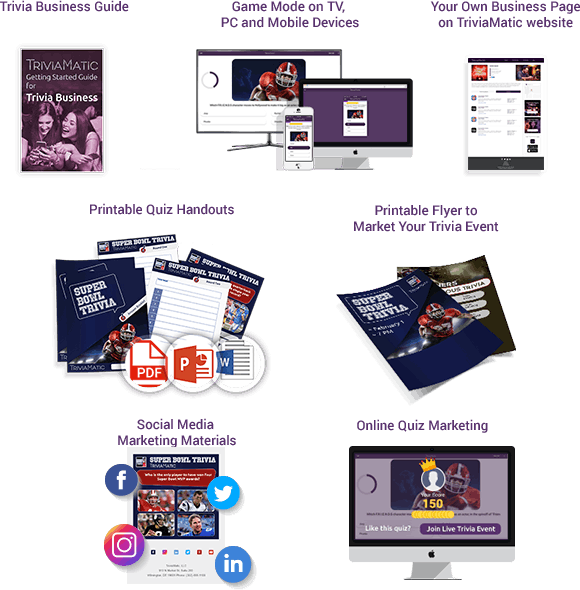 Attract sport fans using TriviaMatic, your ultimate solution for live trivia nights.TriviaMatic will ensure you have your most crowded night of the season before the big day of the Super Bowl game. Trivia game can be run on different platforms with TriviaMatic application. You can both play and run the game on your mobile device. And even more, you can display the game on a TV to engage the crowd. Log in to the desktop version of the game and connect the computer to the TV screen for providing an interactive experience for the players. Trivia Quiz Night is the most fun and reliable way to turn a slow night into a booming night of business. TriviaMatic will provide you with a detailed guide on running a great trivia night from start to finish at your establishment. It will give you some action plans to make the event a success and ideas for promotion of your new initiative. Read our guide to learn how to draw crowds to your venue and get people coming back week after week. Score Cards - meant for the host to a record the results after each round for everyone to see how well, they are doing. You may wonder how you can find new players and make people learn about your upcoming events and your venue location. That is why TriviaMatic platform allows you to create a business profile and make your venue visible to all trivia players in the area. TriviaMatic will display all the events that are being held at your venue and allow you to enter additional info and make it easy for players to find you. Trivia game packages also consist of different graphics to share on social media. You can modify the text and spread out the word about the upcoming event. Before the date of the actual event, you can motivate the players by posting various event-related questions and did-you-know-facts. And last but not least, there is a leaderboard to announce the winners at the end of each event which will encourage the winners to return back for your next event and share their achievements with friends on social media. Flyers and other pre-made printable graphics serve as promotional materials for your event. You can change the event date and time on those graphics then print and stick the printed papers on the walls of your venue to make every visitor aware of the upcoming events. Curious to know what you get into before you purchase the trivia game package? Check out the demo to experience the game and see what it looks like before you buy the event. You can play the sample games right on our website to see how the game is organized.